The weather forecast gave us great doubt for the open night at the observatory. There was, however, an opening in the all-day cloud cover coming our way. So I had to show up: if the public can see so much as a single star through the overcast, they will expect the observatory to be open as scheduled. 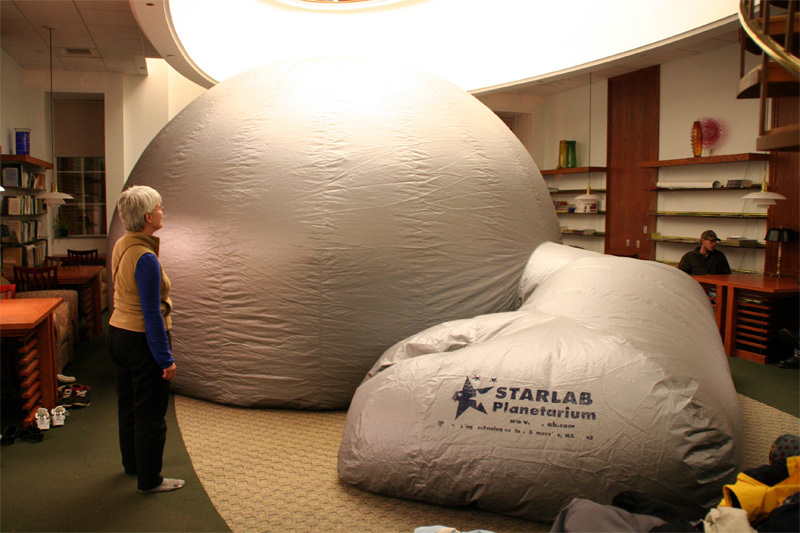 The college had rented the StarLab portable planetarium and staged a Winter Solstice program earlier in the evening and that led nicely into the observatory's 7:00 PM opening. It even got She Who Must Be Obeyed to travel with me to the campus — we both thought it would be a short visit with cloudy skies keeping the observatory closed. The sky, however, cleared by 7:00 and, with temperatures of about 40 degrees (F), opening the dome was tolerable. There were people at the door by 6:45 and She served as greeter. Though transparency was only fair at best, the nearly-full Moon presented an interesting target and the big telescope did its usual job in knocking the socks off new visitors. The lunar image was, in fact, glorious. More than one adult turned away from the eyepiece wide-eyed and slack-jawed after seeing the nearly-full Moon "up close." Turning the telescope to Mars, however, really didn't reveal much. The not-so-good sky conditions prevented us from seeing any surface markings even though Mars was only four days past its closest approach in this opposition cycle (opposition to take place on Dec. 24). One or two of the younger viewers exclaimed "cool" upon seeing the little pink disk through the telescope but I knew what we were missing on account of the cruddy sky. So I'm hoping for better viewing conditions in January with Mars still fairly close. By 9:00 the sky had closed in, completely hiding Mars even from unaided eyes, and obscuring all detail from the lunar disk. Still in all we had about 48 visitors over the evening — one of our best-attended nights!